Nick Redman has had a long and varied career in film, stretching from being a film soundtrack archivist and consultant for 2oth Century Fox, to being an Oscar-nominated documentarian, a moderator for BAFTA LA, and the co-founder of Twilight Time, a boutique Blu-ray label that has a catalogue of rare and fascinating movies. In part one of our interview I talked to Nick about his early days as a film fan, his documentaries on Sam Peckinpah and John Ford, and restoring Fox's extensive film soundtrack library. What are your earliest memories of watching movies? I grew up in a little place called Ewell, near Epsom Downs in Surrey. There was a cinema across the street called The Rembrandt. I practically lived in there. My life growing up was a bit like CINEMA PARADISO (1988). They used to throw out all the little frames that they'd cut out of the 35mm prints, and I would raid the wastepaper basket. I had a huge collection. From 1964 to 1971 I saw everything in that theatre, from ZULU (1964) to the CARRY On films to DR. WHO AND THE DALEKS (1965) to Spaghetti Westerns to THE DIRTY DOZEN (1967) and THE WILD BUNCH (1969). Which films were some of your particular favourites? Obviously THE WILD BUNCH was huge for me, and also films like THE PROFESSIONALS (1966) and ZULU, which still remains one of my favourite films of all time. I just saw so many films, and it was a great period for movies. I mean, there was THE DOUBLE MAN (1967) with Yul Brynner, BILLION DOLLAR BRAIN (1967), WOMEN IN LOVE (1969), THE MUSIC LOVERS (1970), and THE GO-BETWEEN (1971), which is absolutely one of my favourite films. I just connect all these films with that one cinema because I saw everything in there. What was the first film you saw in a theatre? The first film that I saw was actually not in that cinema. It was a film called THE MAGNIFICENT SHOWMAN (1964). It's known in America as CIRCUS WORLD. It's a Samuel Bronston picture, and has John Wayne as a circus owner, and Claudia Cardinale. Why do you think you fell in love with cinema? I used to look outside my bedroom window and every Saturday I'd see a guy changing the movie posters in the cinema. The posters were large, and he'd get a ladder, take the old one down, and put up the new one with long rollers on a long broom-handle stick. It was like a new piece of art I would get to see every week and I used to be completely mesmerised by it. Some people went to church, and I went to the cinema across the street. I wasn't able to go when I was very young because my mother told me that I would get whooping cough in there, but I started going when I was 8 or 9 and I never gave it up. Ironically, I DID get whooping cough, although not in the cinema! When did you become aware of the soundtracks to films? That would have been ZULU. I remember being about nine or ten years old and sitting in the garden, trying to recall the whole film in my mind and remembering that incredible John Barry theme. That's when I knew the music was an integral part of the film-going process. You couldn't separate one from the other. At what age did you begin collecting soundtrack albums? It was probably when I was something like eleven or twelve, but I didn't have much cash, and LPs were expensive. So I had to save up, and it was always ''Do I get Led Zeppelin this week, or something by Jerry Goldsmith or Ennio Morricone?'' Nevertheless, I gradually built up a collection of LPs. I remember even until my early twenties, when I was a bit hard up, I would go to 58 Dean Street (a celebrated London record shop), even though I couldn't afford much of the stuff. I didn't have a huge collection of film soundtracks, but I always used to enjoy the experience of listening to the music. Ironically, a lot of the films that I grew up loving, particularly in the 70s, were very sparsely scored and were never wall to wall with music. It wasn't until the advent of STAR WARS (1977) that the big, big soundtrack came back. When I think of all my favourite films from the 70s – DIRTY HARRY (1971), THE PARALLAX VIEW (1974), CHINATOWN (1974) and particularly PAPILLON (1973), which remains my favourite Jerry Goldsmith score – they were all films that were very lightly scored, and the albums were very short. Films like DIRTY HARRY never even had an album. How did you first get involved in the film and TV industry? I went to drama school, and I was an actor for a while, doing small roles on TV. I gradually decided that I didn't want to pursue a career as an actor and I got on to the other side of the camera. I started working for producers in the late 70s, as an assistant. Then I got involved with the BBC, doing documentaries. By the time I got to America, which was in the mid-80s, I had some projects that I brought with me and I started to try and make documentaries here. How did you begin working with 20th Century Fox on soundtrack albums? When I first moved to America, I didn't know anybody. It was like starting over again. I hadn't had much of a career in the UK. One of the projects I was trying to get off the ground with the BBC was a documentary on film music. In those days, nothing substantive had ever been done about film music or the history of film music. I tried shopping it around here and some of the first people I called were at the record label Varese Sarabande. At that time, Richard Kraft, who is now a well-known composer's agent, was working there producing film soundtracks, and he said, ''You need to talk to my brother, David.'' 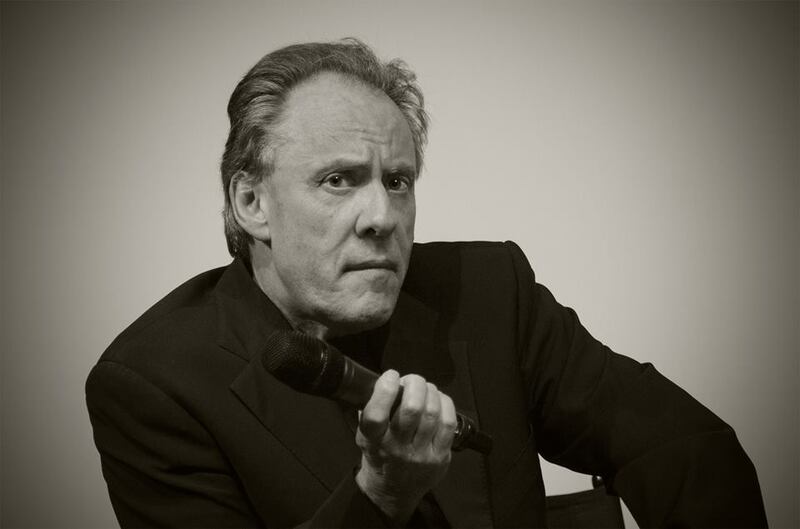 David was a director for Channel 5 News and was the world's biggest authority on film music. He and I got chatting with a view to trying to put this documentary project together. Nobody really seemed interested in backing it, so the Kraft brothers said ''Forget the documentary. Why don't you do something more constructive?'' A friend of mine was starting a record label, Bay Cities, and he asked me to try and get the licenses to some soundtracks from the studios. I started doing that, and after a few years, I got headhunted by Fox because Richard Kraft, who by now was an agent, found out that Fox was looking for someone to go in and excavate the vaults and put together a comprehensive film program. It took several months, but I eventually got the job. Did you realise soon that you had a love for archiving and unearthing soundtrack music? I guess I subconsciously had a love for it because I really enjoyed the responsibility that I had at Fox. I still have that love because I am still doing the job 22 years later. I remain a consultant for Fox, and the ad-hoc person to go to if there is any issue regarding their classic film library. When I joined Fox, the head of music, a guy called Elliot Lurie, said to me ''No one here knows how to do the job that we are asking you to do. Don't come to us with any questions.'' I thought he was joking at first, but he kind of wasn't. I got the brief that I had to wander all over the lot, trying to create friends and trying to create lists and create new divisions into a move towards preserving music. I found a guy called Skip Rusk, who was the head of post-production, who was incredibly supportive. He gave me an office and connected me with all the people. Gradually over the course of a year or two, we devised a system as to how the vaults could be raided and the music recovered. Nothing had been recorded onto tape. It had all been recorded onto 35mm film. All of that film had to be restored before you could get the music. It became an unwieldy, big, and costly job to do. Here we are 22 years later, and the job is still being done. Not every title has come out as a soundtrack album. There are still quite a few films left to go! What are some of your proudest achievements amongst the titles you have restored? The ones that we thought were impossible are my proudest achievements. Something like CLEOPATRA (1963), which was a very big job. The music stems were very deteriorated. I remember telling Alex North's widow that we would get it done by hook or by crook. She has passed away now, but before she did, we were able to complete that job. It took years and years to do. Restoring some of the great Rodgers and Hammerstein classics, particularly THE SOUND OF MUSIC (1965) for the thirtieth anniversary in the mid-90s, was a big one. Some of the classic old musicals like THERE'S NO BUSINESS LIKE SHOW BUSINESS (1954) and science fiction films like THE DAY THE EARTH STOOD STILL (1951) and obviously the STAR WARS trilogy (1977-83), which we worked very hard on over the years. First we did a four-disc set for Arista, and then when the twentieth anniversary rolled round, Lucasfilm wanted to go release special editions of the movies, and we went back to the music and redid the whole thing from scratch. For me, discovering Alfred Newman was a highlight. I knew that he was one of the absolute greats, but when you get to work in the room that he worked in and listen to so many of his scores you realise what an incredible genius he was. Not only was he a genius composer but he was also head of music so he supervised everybody else, as well. I often talk to his son, David Newman, about his father. His legacy is so large and so vast at Fox that it is impossible to think about Twentieth Century Fox without him. What was the genesis of your documentary, THE WILD BUNCH: AN ALBUM IN MONTAGE (1996)? THE WILD BUNCH has always been one of my favourite films, and one of the first things that I did when I came out here to L.A. was to look up some of the people who were important in Sam Peckinpah's world. Even though he had passed, a lot of his relatives were still around and also the people who had written books about him that I was very keen on meeting – people like Paul Seydor and Garner Simmons. At this time, David Weddle had not yet written his biography. I got to meet all these guys and become friendly with them. My deal with Fox was that I was not an employee, I was a consultant, and I had a non-exclusive contract. I was not precluded from going and doing other work at other studios if that work came up. So in the mid-90s, I had been asked by an executive at Warner Brothers called Brian Jamieson to restore the music to THE WILD BUNCH. I said that I would love to, and they gave me full access to all of the original multi-tracks and we remixed the whole thing from start to finish. It was really terrific. While I was doing that job, Brian called me and said that there had been a discovery. While they were clearing out one of the vaults, somebody had found a couple of cans that said 'Wild Bunch 16mm' on them. They didn't really know what they were, but it looked like black and white footage of Peckinpah directing the film. He asked me if there was any value in keeping it. I said I was sure we could find something to do with it. So Brian made it his cause to make sure that all of the stuff that was WILD BUNCH-related in the vault was kept. When we found out what it was, Brian asked me if I would be interested in doing a small documentary to accompany the film's laserdisc release. I called Paul Seydor, who by that time was a very good friend of mine and of course not only a great academic but also an A-list film editor. He was editing all the films that Ron Shelton was doing, and at that time hewas editing TIN CUP. (1996). Ron Shelton is also a big Peckinpah fan. I told Paul, ''You will never guess what has fallen into our lap. All this black and white footage that's silent. It's never-before-seen stuff of Sam directing the film.'' I asked Paul to join me on it, and Ron Shelton very generously let us use all of the TIN CUP post-production facilities so Paul could put together the documentary. He was editing AN ALBUM IN MONTAGE at the same time he was editing TIN CUP. We were able to reduce the budget of what it would have cost to make this little documentary because it got buried in the TIN CUP budget. Consequently, we ended up with a much better product than we otherwise would have, and also because Brian Jamieson green-lit the project and was such a mensch. Once we had made the film, he thought it was so good that he had it transferred to 35mm. These 35mm prints started doing the rounds at film festivals and that allowed us to have it qualified for Academy Award consideration. And then of course it went all the way to the Oscars and we got nominated. Unfortunately, we didn't win, but that little documentary that started on the back of a postage stamp became an Oscar-nominated film. How was the experience of finding out you were nominated for an Oscar? I couldn't quite believe it, because when we started making the film, an Oscar nomination was the furthest thing from our minds. We were effectively making a little documentary to go on the laserdisc release of the film. That was its original concept. It had no life beyond that. When the documentary had been completed and Brian was so supportive of it, and had sent it to film festivals in 35mm, it got traction as they say. It got reviews in Variety and The Hollywood Reporter, and I started to realise that this little film was like The Little Engine That Could. It could go the distance. Then when the Oscar nominations were announced at dawn, as always about 5 am, I got a call from a friend of mine who said ''Guess what? You're now an Oscar nominee.'' So we went to the Oscars, and it was a great experience. Entertainment Weekly had written that they thought we would win, and I was worried that we were being tagged as the favourite. The winner was a film called BREATHING LESSONS, directed by a young woman called Jessica Yu. She made a film about a poet in an iron lung. As you know, the Oscars are incredibly sentimental about anyone who is an invalid. As soon as we knew our competition was a film about a guy in an iron lung we thought, ''We're dead.'' And we were. What were your initial hopes for the documentary? Were you hoping it would revive interest in Peckinpah? I think so, yes. Ever since I had become friends with Paul, which was back in 1990, we had been getting together with the surviving cast and crew members of Peckinpah's films, and members of his family. At that time Peckinpah had not been dead long and he was not the venerated giant that he appears to be now. I think it was because his end had been a horrible decline. By the time he passed away, he had drifted into the ether. I think it was in our minds in the 1990s that we would try to redress the balance. David Weddle's incredible biography of Peckinpah came out in 1994, right before we made the documentary. So there was already a move towards redressing the balance. When our documentary got an Oscar nomination, we felt that this was partly a validation for Peckinpah and a reward for all the times that he had been stiffed at the Oscars. We were proud that we could do a little something. Since then, we have continued to do various projects that are Peckinpah-related, and now nearly twenty years later he occupies the venerated spot that he should have all along. Do you feel that your documentary helped it happen? I do. It spawned a lot of books. Before our documentary was made, there were maybe four or five books on Peckinpah. Now there are something like 45 books, and you can trace the renaissance from the late 90s, so there's no question about that. How did you come to make the John Ford documentary, BECOMING JOHN FORD (2007)? I had made a number of film-related documentaries over the years I had been here in L.A. Ironically they had all been for Warner Brothers. I had not done any for Fox, and yet by the time we did the John Ford documentary I had been involved at Fox for fourteen years, doing the soundtracks. There was an executive in the Home Entertainment Division at Fox called Richard Ashton, who was a Brit. Fox proposed a box set of 24 John Ford films all in one box. Richard liked a particular producer, a young woman named Jamie Willett, who had done a tremendous amount of special features and bonus materials for Fox DVDs. I had worked with her on a couple of occasions and we split the duties. Jamie would effectively produce the documentary and I would direct it. Julie Kirgo would write it. This was in the spring of 2007 and we had to make it very quickly because the box was going to be released in December. Effectively the film had to be completed by August. Brian Jamieson was segueing out of Warner Brothers and was consulting with them and other companies at that time. He had mentioned our film to the Venice Film Festival and they said they would take a documentary on John Ford, providing it was good enough, and premiere it. The bad news was that in order for it to premiere at Venice, it had to be completed a month earlier, in July. We were really under the gun. I tried to make it easier for ourselves by creating this conceit that everyone we interviewed was watching a John Ford movie in a screening room. We could interview everybody on that set and not go anywhere else. We lost a bunch of people I would have loved to have had because they couldn't come the week we had that set up. The theatre we used is the very theatre that Ford and Zanuck sat in, viewing dailies. Using that theatre had verisimilitude so I wasn't going to give that up for anything. What is it that you love the most about John Ford as a director? As with Sam Peckinpah, John Ford is not a guy you would want to sit around with and chew the fat. Where is it written that these guys should be nice guys? Because they're not. They're real rough birds. You have to separate the personal behaviour of these guys from the work. Ford's movies are like the paintings of the Old West that you somehow saw etched in your mind when you were a child. There were British kids like me growing up in the 60s who loved the idea of America and kids who hated the idea of America. The general attitude of the time in England was anti-American. I would be in my History class at school talking about how I always wanted to go to America and the teacher would ask me why the hell I would want to go to that god-awful place. My images of America as a kid were half formed by images of the mountain ranges, the deserts, the Old West, the western expansion, something about the idea of getting in a covered wagon and going from a so-called civilisation to a barbaric wasteland that would have to be settled and a whole new world would be born. Those were inescapable fantasies to me that I learned from watching the movies of John Ford. It worked on you subconsciously. You didn't know what you were watching when you were young. All you knew was that there were these black and white images on your television that spoke to you like paintings that came alive. When you get older, and you try to research what it was that you saw, you find out that they're all John Ford movies. These things are like DNA, pieces of yourself that you can't separate yourself from. That's really what the film BECOMING JOHN FORD was about. It was about how you and the celluloid became one. You get to a point where you cannot separate the dream from reality. All you know is that you feel alive when you're watching the film in the theatre and that is what we tried to replicate in that film. It took me back to being an eight-year-old taking filmstrips out of that bin. It was tactile. You were touching a piece of the film. It was alive, a tangible thing. We got a lot of interesting people to talk in the documentary. It was really about a love of America. That is what comes through more than anything. I spoke to Nick by telephone on 18th November 2014, and would like to thank him for his time. 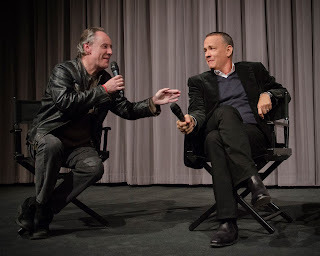 (1) Nick interviewing Tom Hanks for SAVING MR. BANKS (2013). 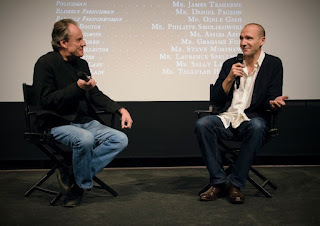 (2) Nick interviewing Ralph Fiennes. 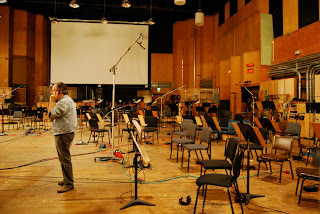 (3) Nick on the Alfred Newman Recording Stage at Fox Studios. 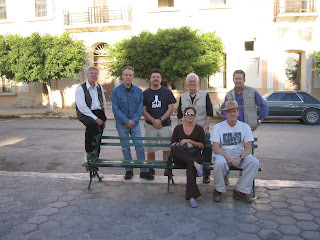 (4) In Parras, Mexico: Jesse Graham, Nick, Jonathan Redman, Paul Seydor, Garner Simmons, David Weddle and Lupita Peckinpah. 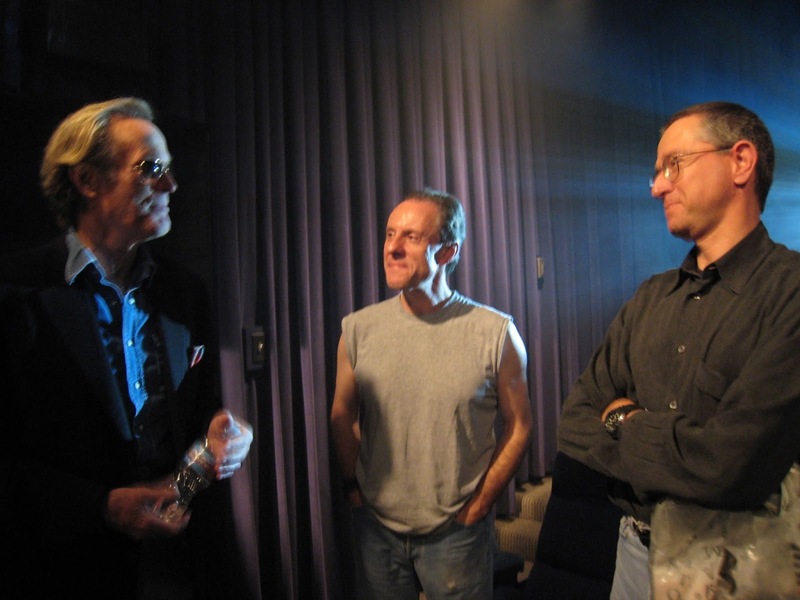 (5) Nick with Peter Fonda and screenwriter Lem Dobbs whilst shooting BECOMING JOHN FORD. All photos are (c) Nick Redman and cannot be reproduced without his permission.